Right now crossing the Gulf of Aden on its way to the Red Sea is a catamaran that is nearing the end of a journey that, when it’s completed, will have taken it around the world. While there’s nothing special about a boat circumnavigating the globe, what is special about this catamaran is that it is making the trip powered entirely by solar energy. The Tûranor PlanetSolar catamaran was envisioned by Swiss electronics engineer Raphaël Domjan. Its name derives from J.R.R. Tolkein’s Lord of the Rings saga and translates to “the power of the sun.” A man “in love with nature,” the Tûranor PlanetSolar is Domjan and team’s message to the world that we “rapidly need to find alternatives to our wild oil consumption” and at the same prove the potential of renewable energy. The solar-powered catamaran which, according to its builders is the largest of its kind in the world, is 24-feet-tall, 100-feet-long and 50-feet-wide. It’s deck is a 537 square meter (over 5,700 square feet) array of photovoltaic cells – 38,000 in all. The cells charge an array of lithium-ion batteries that provide electricity to four motors. The panels have a sunlight-to-electricity conversion efficiency of 18.8 percent which is comparable to most efficient panels now commercially available. The converted power can push the catamaran to a maximum 127 HP, but the average cruising power is a much slower 26.8 HP. If it’s a cloudy day, the number of solar power-collecting cells can be boosted by increasing the length and/or width of the deck. The power of the stored electricity to propel the catamaran is maximized by a “wave-piercing” design that slices through the water rather than rides the waves. To help promote their cause, PlanetSolar, the team behind Tûranor PlanetSolar got some help from Swiss electronica band Yello. If you love electronica, and solar-powered catamarans, you’re going to love the following video. Tûranor PlanetSolar is maintained by a crew of four but can carry as many as 40 people. It launched from Kiel, Germany in March 2010 after 14 months of construction. It set off for ports in Miami, Brisbane, Singapore, Abu Dhabi, and others, disembarking along the way to meet with government officials and to publicize their cause. Their course was set to roughly follow the equator where sunlight is most direct. As I write, the catamaran is 525 days at sea. It’s due to arrive at its final destination in Monte Carlo sometime this spring. Always remember to bring along a security team when cruising a $17.5M boat through pirate-infested waters. Conquering the world’s addiction to oil is just one of the challenges that PlanetSolar, the team behind Tûranor PlanetSolar, are taking on. 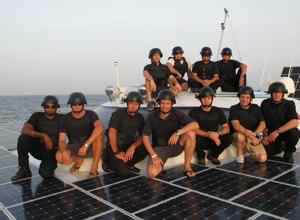 Their latest newsletter, dated March 5th, conveys the crew’s apprehension at entering the Gulf of Aden. Located between the north coast of Somalia and the south coast of Yemen, the gulf represents some precarious waters. Without a heavily-armed ShadowHawk drone to stave off potential assailants, the crew has gone tactical. They enlisted the help of a former Swiss Army chief and hired a private security firm made up of former soldiers from the French Army. “We make sure to keep as much energy as possible in our batteries in case we would need to make evasive maneuvers.” It’s all fun and games until you have to outrun a band of Somali pirates. While I admire the Tûranor’s efforts to spread the good word on green energy, with a $17.5 million price tag, most boaters are probably stuck with their gas guzzling vessels for the time being. For that matter, why would green boaters want to go solar when they can go sail? Immo Stroher, one of Domjan’s investors, told the Miami Herald that their purpose was not to promote solar-powered ships but to promote renewable energy. They say they want to motivate engineers and scientists to develop new, innovative technologies. It’s always difficult to assess how valuable publicity campaigns are in drumming up cash. One has to wonder if putting the $17.5 million towards actual research wouldn’t have done more to further their cause. 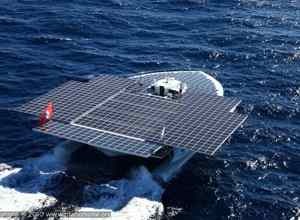 Regardless, the challenge to build a catamaran that can sail around the world entirely on solar power was a formidable one. The Tûranor PlanetSolar is a technological triumph in its own right.